RiskRhino offers easy to use yet complete GRC Software. RiskRhino is the software backbone to help you to efficiently embed GRC in your organization. Modern technology to help you drive your organization forward whilst minimizing risks with a minimal effort and investment. Of course safely hosted and available as a no investment SaaS model. Your GRC platform can be up and running in minutes. You can start at any point you want, be it a compliance or legal requirement, management dashboards, audits or continuous monitoring or risk assessments. 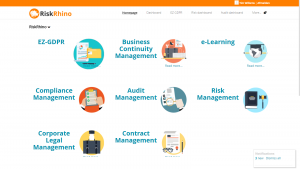 The GRC platform works together with our other functional components like Business Continuity Management, data privacy compliance (GDPR), Contract management and e-Learning. Rest assured, RiskRhino offers all required functions that you need today but also tomorrow. We will not list them here since that will be a long list. Just get in touch and we will let you know how RiskRhino will efficiently support your project and ongoing GRC process. Full audit function (including findings etc). Document management (built in) . . .
We will gladly show you how your risk and compliance management can be supported by this most complete yet easy to use SaaS solution.